How To Use Color In Your Interior Decoration? One of the cornerstones of interior design is color. The color palette that you use can affect almost every aspect of the room you are working in. Therefore, you need to have a good grasp of the colors you can use before you start your project. Colors can affect the mood of people in the room which is why any choice you make should not be taken lightly. There will be a color that will suit the look and function of the space the best. The right colors will be able to make even the smallest rooms seem airy and large while a blank space can be imposing and strong. The wrong color will ruin the elegance of the decorating project you are completing. Therefore, you need to choose very carefully. If you want your space to be inviting and entice people to enter and come into the room, you should look at warm colors in light shades. These colors are ideal for your living room and the bedrooms. This is due to the fact that you want to relax and unwind in these rooms. You can apply colors to different parts of the room, but the walls are the most visible and common option. The most typical wall coverings will be solid colors and striped patterns. However, many designers are using accent walls which are a single wall that is painted in a bold color while the other walls are neutral. This is a very good trick to use if you want to easily showcase which area of the room is the most important. When you use an accent wall, you will have to pick a color that really stands out. This could be something like a dark shade of wine or olive green. If you want to create a more modern look that is sleeker, you could consider monochromatic colors. The stark contrasts that they provide will make the design more interesting overall, regardless of the room’s purpose. When you are restricting the colors that you use, you need to incorporate texture to add something interesting to the room. A rich area rug or an ornate quilt can help to give your monochrome rooms a splash of personality and life. If you are new to the whole world of interior design, you will still be able to achieve an amazing result when you follow a few simple tricks. The first is that cool and light colors will make even the smallest of spaces seem much larger. Low ceilings will also look airier. Using these colors is a fast way to expand a small room. 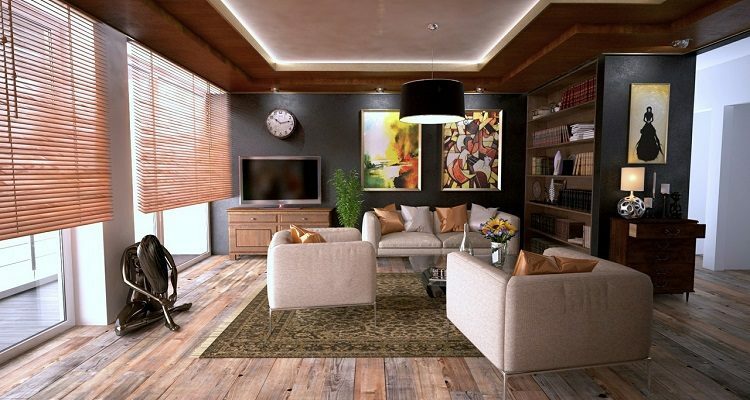 On the other hand, you can use deep and dark colors to make a room feel more intimate and cozier. The safest option will be to start off with a neutral color on the walls which works as your base. This allows you to freely decorate the interior of the room with the color scheme and theme that you want without worrying about clashing with the walls. Of course, you will need to look for pieces that are striking to ensure that the room is still vibrant. For the most part, you should use dark colors for flooring because this will go with any décor. If you worry that the flooring is going to be boring or too plain, you can break up the texture or color with the use of an area rug. Carpet that has already been installed can be broken with an area rug that is a different shade to add a bit of depth to the floor. You should not have a hard time finding a rug that is able to complement what you already have in the room. Rugs of solid color will be the safe option if you are not comfortable with the bolder ones. Patterned and bright rigs will create a focal point in the room without too much effort on your part. The best thing about using rugs is that it does not take too much commitment as you can always replace it if you no longer like it.